So just what is a super scarf besides being the trendiest knit Fall accessory this year? They're kind of a shawl, blanket and scarf all wrapped up in one. You can wrap this big lush scarf around your head, neck and shoulders to keep warm and cozy on those blustery days. Basically it's a knitted scarf that is knit much bigger and wider than your typical scarf. So what size makes it a super size? Plan on knitting your scarf at least 10 – 15 inches wide and anywhere from 84 – 100 inches long. OK confession time. My scarf isn't as long as it should be. In fact I was only able to make it 75 inches long. You see I have severe carpal tunnel in both my hands. This scarf knitting project was really tough so I knit it as long as I could and then had to stop. My knitting intentions were good but my hands gave out on me. Just a note here: While this is a super scarf knitting pattern, you can make it any size you like. It doesn’t have to be a super size. Any way you want to knit it, it will look wonderful and cozy. Also remember to knit your scarf according to your own size. So if you are shorter you may not need to make it as long; maybe 70 inches will work for you and it'll be super. If you're taller you may want to knit a scarf longer than 100 inches. Decide what you're happy with. You can use any type of yarn to knit your super scarf. I made mine with a super bulky yarn although you can use worsted weight or chunky as well. It's up to you and what kind of yarn you'd like to use. 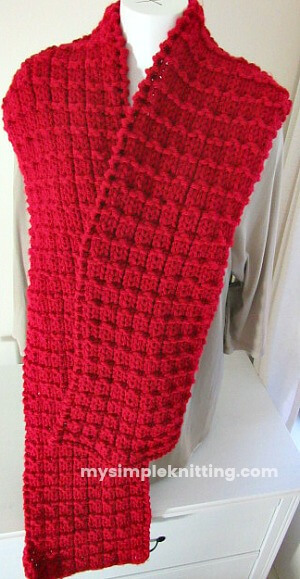 I also created this scarf knitting pattern in the waffle stitch. This way you can practice the waffle stitch pattern and create something warm and snugly. Ready to get started? OK.